As galgos wish, committed rescuers and volunteers around the world work tirelessly to find homes for the nearly 100,000 galgos abandoned each year as a result of the hunting season in Spain. Often, these sweet, funny, athletic dogs are left on the streets, sick & beaten with no source of food or shelter. The As Galgos Wish collection brings together a unique community of designers, artists, crafters and makers to create amazing products that illustrate the hopes, dreams and wishes of the galgo so that they may find peace. By purchasing a product from the As Galgos Wish collection, you are showing your support, building awareness of the galgo and making those wishes come true. In addition, you are supporting talented artists and entrepreneurs with a passion for doing good in the world. Proceeds from the sale of these products goes directly to Save A Galgo Espanol, a 501c3 registered nonprofit. It is the goal of the As Galgos Wish collection, that each year new artists and designers will create truly amazing products that inspire and dare us to remember the plight of the galgos in Spain. These products will be a limited release and available in limited quantities so if you see something you like, don’t miss out on the opportunity. The theme this year, wishing on a dandelion, is truly representative of this campaign where some will see a weed, others see a wish. Just as the galgeros see no harm in discarding or killing a nonperforming or slow galgo hunter, others see the beauty, hope and value of these special galgo souls. Company Story – Owner Mary Heyworth has been sewing since her early teens. With a daughter who is a greyhound lover and owner, she absolutely loves that her daughter’s greyhounds wear clothes and enjoys sewing for them. Over the years, Mary has become a regular at many greyhound events in New England. Her passion for her work and love of the sighthound breed, shines through in her craft. Mary also offers a full range of greyhound coats, collars and other specialty products. Visit her website at www.classycouchpotatoes.com. 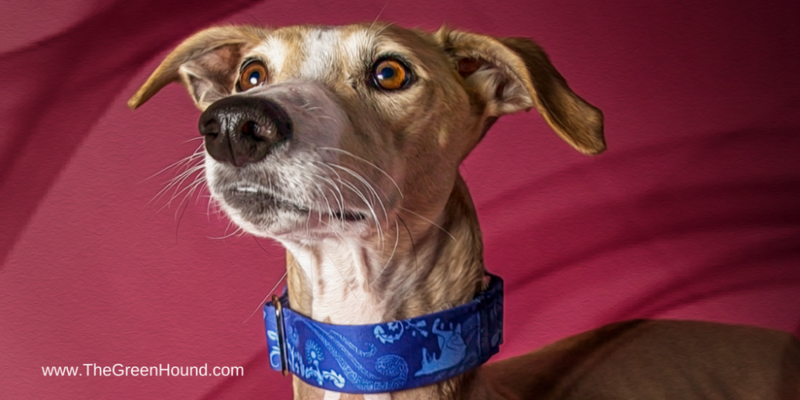 Product Story – This collar features fabric specifically designed for this year’s As Galgos Wish Collection. Myke Brugnani, Fabric Designer – A talented artist, pet lover and design studio owner captures the beauty of galgos wishing on a dandelion. In bright vibrant colors, his design depicts the happiness and peace of all galgo dreams. Wrap yourself or your pup in galgo wishes by purchasing one of many products highlighting Myke’s design.